Necrosphere is where you go when you die, regardless of being good or bad. You don’t see other people around there, and you don’t have anything to do except to wait eternally. Soon as the player (Agent Terry Cooper) hits the Necrosphere, he learns about the portals that can take him back to the world of the living (also called Normalsphere), and his quest to escape the afterlife is set. Features: – Innovative controls: Only two keys! – At least 2.5 hours of tough, NO FILLER gameplay! – One big, maze-like universe! – Deliciously frustrating! – Spandex ballet suit! The game is made by Cat Nigri. During Gamescom 2017, we had the pleasure of meeting up with Caio Lopez and Nando Guimaraes of Cat Nigiri studio. They told us a few things about the game and the studio behind its development. The game is basically a mini-metroidvania that has a total of two buttons for the player to use. “It’s supposed to be a very hard game, inspired VVVVV, Super Meat Boy and Metroid” Caio explained. The developers told us that the game is basically made in such a way that it can become addictive for anyone that loves to speedrun games like that. The game was developed by one person while the studio was working on another project, named Keen. The game has been in development for six months now and it was basically made during the developer’s free time. The game is actually already available on GameJolt. The game will be released on the 1st of September on Steam and also on PlayStation 4 and PS Vita, Xbox One near the end of the year. There are some plans for the game to come on mobile too but that is not yet certain. “It is a small game, with about three hours of gameplay,” the developers said. 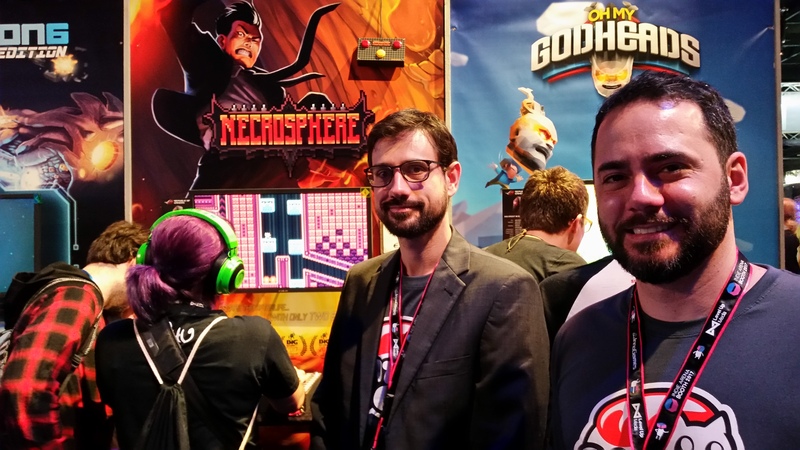 They also told us an interesting story about how the studio ended up hiring a programmer that managed to finish the game in a faster time than the creator of Necrosphere himself. For more info on Necrosphere take a look at the game’s Website, Twitter, Facebook and Steam page. Humble Indie Bundle 17 is here!